John McCain won the Florida primary despite losing among mainstream Republican voters, including evangelicals, conservatives, and white Protestants. He owes his remarkable victory instead to support from Hispanics, those over 65 and independents. Florida was the first big state to hold its primary. With 10 million registered voters, it is more typical of the US electorate as a whole than Iowa or New Hampshire. But it does have some unusual characteristics, including a large Hispanic community based in Miami, a large number of retired people, and an important group of military veterans. And it was these groups who gave Senator McCain with his margin of victory. Hispanic voters were only 12% of the Republican electorate, but they voted 54% for Mr McCain, with only 14% for Mr Romney, and 24% for former New York mayor Rudy Giuliani. 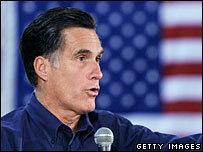 Among white voters, who made up 84% of voters, Mr Romney actually beat Mr McCain narrowly by 34% to 33%. Fully one-third of Republican voters in the primary election were over 65 - much above the national average - and they gave the Arizona senator 41% of the vote, compared with 31% for Mr Romney. Among voters aged 18 to 65, voters split evenly between Mr McCain (32%) and Mr Romney (31%). Mr McCain, a former Navy flyer who was captured by the North Vietnamese, also ran strongly among those who had served in the military, who made up one-quarter of the Republican electorate. They gave Mr McCain 42% of their votes, compared to 35% for Mr Romney, with Mr Giuliani, despite running on his experience during 9/11, doing particularly badly among this group. In contrast, Mr McCain was particularly weak among traditional Republican voters. 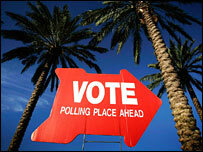 The Florida Republican primary was closed, and only voters who had previously registered as Republicans could vote. Nevertheless, nearly one in five voters told the exit poll that they were now independents, and this group went strongly for Mr McCain. He won 44% of independents, but only managed to tie Mr Romney (at 33% each) for support among still declared Republican voters, who made up 80% of the electorate. Similarly, Mr McCain ran strongly among the minority of Republicans who described their political views as liberal or moderate, while losing 29% to 37% to Mr Romney among conservatives (who made up 61% of Republican voters). And he lost among those Republicans who thought President Bush was doing a good job, while winning strongly among the minority of his party who are disillusioned with the current Administration. Religion plays an important part in American politics, with many Republican voters having strong religious belief. Mr McCain only finished third among evangelicals, getting just 28% of their vote, with Mr Huckabee, a former Baptist minister, and Mr Romney tied for first. Evangelicals made up one-third of Republican voters in Florida, and they are a group Mr McCain will have to reach out to on super Tuesday, when 24 states select delegates to the Republican convention. 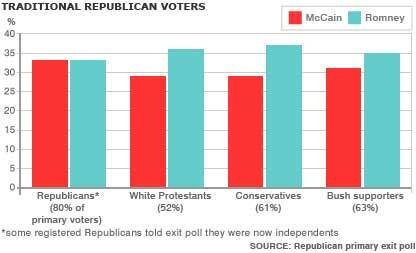 Mr McCain ran much more strongly among Catholics, where he won 40% of the vote, while he lost the white Protestant vote to Mr Romney by 31% to 34%. Mr McCain also ran strongly among those who do not attend church services regularly or who have no religious beliefs. Mr McCain's strongest appeal to voters was his character. About half of voters said character was most important in deciding who to vote for, and they went strongly for Mr McCain; while those who said issues were more important tended to back Mr Romney. Voters who said the top quality they looked for in a candidate was either experience, or saying what he believed in, voted strongly for Mr McCain. Those Republican voters who wanted a candidate who shared their values tended to support Mr Romney. The economy emerged as the most important issue for nearly half of all Republican voters in Florida, far ahead of immigration, terrorism, or Iraq. Mr Romney showed particular strength among voters who were worried about illegal immigration, an issue in which he disagrees sharply with Mr McCain. But only 40% of Republican voters supported his policy of deporting illegal immigrants in a state with a strong immigrant presence. And the debate on the issue may have helped mobilise Mr McCain's Hispanic supporters to turn out. The results in Florida demonstrate why Mr McCain, with his appeal to the centre ground, is the strongest Republican challenger to Democratic candidates in the November election. He is the only Republican candidate who currently is running level with either Barack Obama or Hillary Clinton in national polls. But only 5% of Florida Republicans cited "electability" as their main reason for choosing a candidate. These results show that he still has an uphill task in convincing more traditional Republican voters to back him as we approach Super Tuesday, when 24 states vote next week. This analysis is based on the Florida exit poll of 1516 Republican primary voters conducted by Edison Media Research and Mitofsky International in 40 precincts across Florida on Tuesday. The samples include 235 Republican voters who voted early or absentee and were surveyed in the past week by telephone, and has a sampling error of +/-4%.